Kesha Lee is Atlanta rap’s secret weapon. 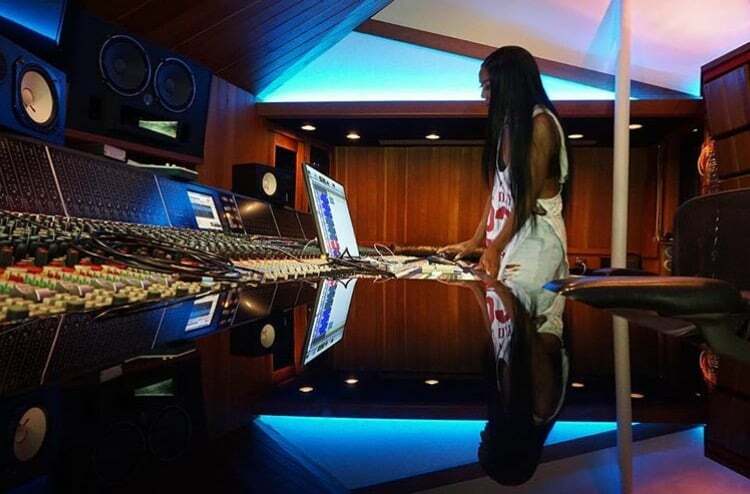 In just five years, the 28-year-old, from Birmingham, Alabama, has been an in-house engineer at Gucci Mane’s Brick Factory, worked on hits by the likes of Migos and Future, become a go-to for Young Thug and Playboi Carti, and, most recently, had a major hand in the recording and engineering of Lil Uzi Vert’s very highly anticipated debut album Luv Is Rage 2. Calling from her car while driving through Atlanta, just two weeks before the release of LIR 2, and in the thick of its final recording and editing phases, Kesha took some time to share her story. We talked about how she got her start as an engineer and the moment she knew she was doing exactly what she was meant for. 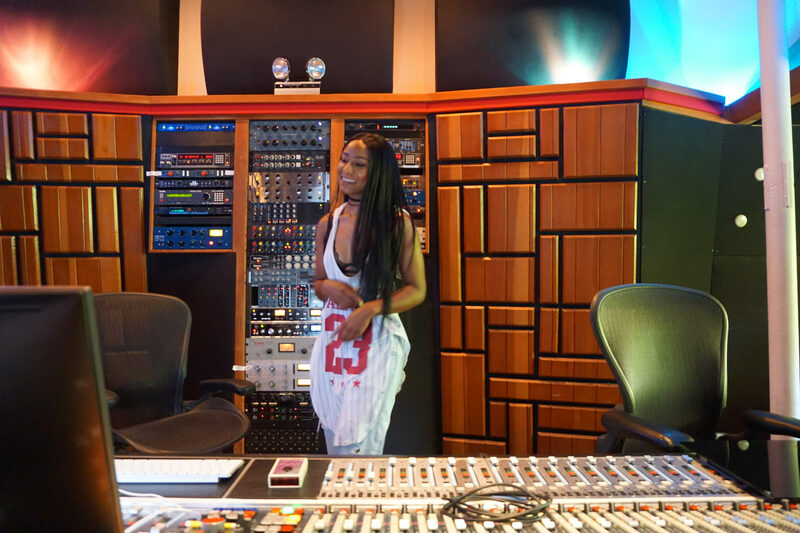 She also gave some insight into the recording of Thug’s E.B.B.T.G, working with Uzi, and why you should never, ever turn down a session. What initially led you to pursue engineering? I knew I wanted to be in music, but I didn't know exactly what. I didn't want to go to school, but [my mom] was in the military so her kids could go to college for free, so I ended up choosing [the University of Alabama at Birmingham]. I wasn't really happy with the music program, though, so I kind of just quit college and tried to figure everything out. And then I found [the Atlanta Institute of Music]. Not really. My dad was into it — that's how I really got into it, Pro Tools and stuff. He played the piano, he built computers and software, and he did woodwork. He would always build me a computer. In high school, so maybe like 10th grade, when I told him I kind of wanted to get into music, he was like, "Well, you need to learn how to do everything. You need to learn how to play the piano, you need to learn how to write songs, you need to learn how to record." So he bought me all of this stuff. I wasn't into it that much, so for years it just kinda sat there. He was in Pennsylvania, and I was in Birmingham, so he would call me on the phone and try to explain how to use Pro Tools, but Pro Tools was too hard, so he ended up buying two other programs, and we would just be on the phone trying to figure out how to work stuff until we gave up. Later on, I figured I'd play around with it. So I took these classes at, it's kind of like a Guitar Center, called Bailey Brothers, and they have Pro Tools classes. They taught me the basics: how to record, what the track is, stuff like that. So those classes got you going seriously? A little. I played around with [the equipment] a bit and then I stopped again. I guess what got me back into it was when I moved out of my mom's house and was working at a bunch of restaurants. I was working at T.G.I.Friday's, and that didn't work out so I worked somewhere else, but I just got tired of the jobs I was working. I was like, "If I don't break this cycle, this is going to be my life." So I started to think, "OK, what could I get into that's music related?" Buck Wild, he's a radio personality for, I think it was 95.7 — we were friends on Facebook, and I messaged him asking if I could intern at the radio station. Eventually I did, I got an internship, and then they hired me for one day a week. I was cutting commercials, just playing around, 'cause it was an internship and he was showing me, and he was like "You're really good with using Adobe, why don't you think about going into engineering?" I didn't know [engineering] had a name, I didn't know what it was. He was like, "You should talk to Isis [another radio personality] because she went to Full Sail, she went to school for that." So I talked to her, and I ended up finding other schools similar to Full Sail, because I looked up Full Sail and it was in Florida, it was far, and they don't want you to work while you're in school. What was your program like? The classes weren't that big, and the program was 11 months long. The school wasn't as big, but it was perfect. They taught all of what you needed — live sound, how to make cables, MIDI, or how to make beats. They taught us music theory, how to work on analog, and in their curriculum, they took out Logic but they taught us Reason, Pro Tools, a little bit of everything. Did you have exposure to people and places during the program that might have been valuable to you later on? Definitely. Future's engineer Seth Firkins, because those are some of the sessions I was sitting in on. And also Gucci [Mane], I met him while I was in school and I started sitting in on his sessions. Working for Gucci, I feel like that's the big reason why I am where I am today. Once I finished sitting in with him, he had gotten his studio, and once his studio was up and running, he hired me. I was the in-house engineer. Sean Paine is his engineer, was his engineer before me, and still is his engineer to this day. But, he had a bunch of artists that would come through, so it was the Migos before they had "Versace" — they were new to me at the time. And then [Young] Thug, Peewee [Longway], Young Dolph, Waka Flocka, [Young] Scooter, and a bunch of other people who were constantly coming through to the studio. So even though Sean was Gucci's engineer, I was there to record other people, or we'd swap a lot — like if he was already recording someone and Gucci was ready to record, I'd go record Gucci. What was the moment you knew you made the right decision in pursuing engineering? I think it was when I first started school. The schools I was going to before, I wasn't happy. I was missing classes all the time, I would sleep late, I would literally wake up and go to my school in pajamas. I was over it. When I got to this school and moved to Atlanta, I was so excited to start class. There would be times when they would kick me out of the school, telling me, "We're about to close in ten minutes," and I would be like, "We still have ten minutes left!" I would literally be there from open to close, even if I didn't have class. I’d come home to my apartment, call my mom, and have so much to tell her about what I learned. It was moments like that, when I was like, This is what I want to do, because I'm way too happy and I’m enjoying when I'm learning. Was there a mentor that's been there for you professionally? Or a guide? I think [Don] Cannon is a good mentor. He knows a lot about beats, production, plugins, and just being around him I learned so much without him even having to say a lot. And he gave me my engineering bag, which I carry with me everywhere. The more I get into engineering, the more stuff I need to carry. At first, it started out with a flash drive, and then I started freelancing, and people had different mouses, so I started carrying around the mouse and keyboard that I was comfortable with. Then my mom got me a laptop. The bag kept growing, and the bag that I was using kept breaking, so he gave me this Tumi bag, and it's the best ever. Him and Uzi got me the Apollo interface, so he's really helpful in the sense of saying what it is that will make me a better engineer, and he'll go get it or show me. He's definitely my mentor. What kind of equipment and programs do you normally use? I love Pro Tools 10. I've tried 12, but I still love 10. The main reason I like 10 is because Auto-Tune 5 doesn't work in 12 yet. I just think it's very natural sounding. I want to get into Ableton a little more, but I haven't had time to really play around with that yet. In my bag, I had to take some stuff out because it was just too heavy, but I think the heaviest thing is this hard drive case that I have. On top of that is another carrying case that houses cables, headphone attachments. In other sections are cords, my mouse. In a picture from the recording sessions of E.B.B.T.G., I saw a photo of what looked like you re-wiring or setting up a microphone. 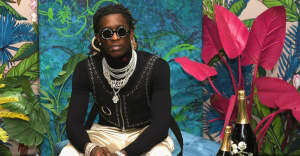 Thug prefers to record outside [of the booth]. I like it that way too, because his rapping level and his speaking level are different, so he speaks lower than he raps. A lot of engineers really can’t hear him, so I think that’s the main reason why he brought the mic out. It’s just a way more comfortable setup, especially because he likes his stuff a certain way, he likes to see the screen, I think. There’s usually an assistant engineer, so someone else brought the mic out — they’re the person that knows the room, I don’t wanna take credit for that. What does your job entail day-to-day? How has it changed since you entered the field? It varies. Right now, it's really just to be there for Uzi since he's working on his album. I freelance, so when he's gone, I'll work with other people. But right now, I'm just not working with anybody else so we can focus on his album. That's literally been my life — recording him, and if there's any time outside of the recording session, mixing and working on his stuff, any creative ideas, invoicing, or organizing the drive. If Uzi's here, I get two or three "where you at?" texts, and that means he's ready, so I come to the studio. A lot of times, the general manager for [the studio], Generation Now, will text me, her assistant will text me, and then that's how I know it's time to go to work. Right when I graduated, in 2013, I was the in-house engineer for Brick Factory, so it was just a bunch of recording all day, everyday. After that, my work flow changed, because I got into freelance, so I was working at a bunch of studios, but it was still sessions, they just weren't long. They were like four, maybe eight, sometimes two hours long — it was all over the place. When I got to Mean Street [Studios], it was recording. I would do Gangsta Grillz mixtapes. I really got into mixing when I got there. I was still freelance, too, so if I went and worked for a producer, we may not be recording the whole time, but it's a lot of going back in old sessions and editing, or replacing the snare or kick, or lining it up to the 808, or adding something to the vocals. Or tracking out a beat. What artist changed your perspective or is important to you personally? Definitely Uzi. I've been working with him for almost three years now. Cannon is the one that wanted to bring me on to that situation. When I first worked with him, I think he asked me, "How did you like the music?" Him and Gucci are my favorite artists, and I love working with Uzi, I love his music. I'm already doing what I enjoy, so working with him — I didn't think about how far it would go. So for him to really just take off, it's so dope. It feels good to have the stuff that I work on really go somewhere. Not that the stuff before or the people I worked on [before], their stuff didn't go anywhere, but when you freelance or bounce around [with multiple artists], it kind of hurts you in that you're not a part of a complete project. I may record a song or a bunch of songs, but those songs may not make the project or make it as a single. So, you know, all of Mean Street, working with Uzi, that did that for me. Being there from the jump, you kind of get to grow with the artist, too. Definitely. Because I do think when I first worked with Uzi, I would still get creative and stuff, but it was mainly recording. I never thought of myself as a mix engineer and I still don't because there's so much I need to learn. It's just so cool working with people that see [my potential for growth]. Has anything stuck out to you or surprised you about working on this album in particular? Definitely going to L.A. and working with Pharrell. I heard he was going. Sometimes these trips are kind of quick so I don't go, but this time they ended up taking me. They originally set three days to work with him, but they extended a day or two. It was really dope. I had already met him, but I never had worked with him or recorded him, I was just sitting in under his engineer Mikey. I always respect engineers, because that's how I came up, being a fill-in or a backup engineer. It's their setup, it's their template, it's how they save the file, so it's really you coming in and following their certain way of doing things. When we were there, when I heard Pharrell say he was going in the booth, I got up [for Mikey to sit down], but he was like, "No, you can record me." So I sat back down. I thought that was so dope. It was cool to be able to actually record him. Do you feel now, in this way, you want to help other young people in the field? Maybe young women in particular? I definitely do [want to help], but not in the traditional way, because I see now, coming up, what helped me and what really didn't. A lot of people think sitting in [on sessions] — it helps with networking, and overall seeing how a session is run, but after a while, sitting in is literally just sitting there. A lot of times, if you're watching an engineer and you're looking at their hands, you can't see what they're pressing on the keyboard. You can't see what they're doing on the screen. And if you're looking at the screen you can't see their hands. So as an engineer, after a few sessions, I don’t think it’s beneficial. I want to help people in a way where I'm just letting them know stuff that they normally wouldn't see or hear. I'm still trying to figure out how. Do you have any advice for any other people who want to enter your field? If you could tell them one thing right now? I definitely would tell them don't turn down any session. I don't care how you feel about the location — I know I've recorded off a laptop before. I've recorded and not gotten paid. Don't worry about money at first. I think a lot of people try to jump into something and worry about money and that hurts them in the beginning. Because even if it's free, the payoff is later. I know some people want to work with a certain caliber of artist and want to jump into that right away, but t I think it's important to work with everybody. And I think it's important to understand what the artist wants. Just because you don't understand it and it might not be art to you, it's art period. If you can really understand what it is the artist is trying to do with their music, your job as an engineer is to take it to the places they're trying to take it to. It can turn out to be amazing if you stay open minded.